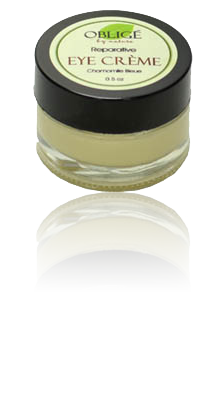 Eye Care Crème for added protection around the eye in a 1/2 fl.oz. glass jar. This creme has been specifically formulated especially for the extremely vulnerable area of the skin around the eye. The phospholipids lecithin based emulsion allows the nutrients to be delivered deep into the layer of the skin. An eye cream is a special type of cream rich in nutrients, but still light enough to avoid clogging the glands around the eye. The dermis or inner layer of the skin around the eyes is much thinner than on the face. Since the dermis is the layer of the skin which brings nutrients to the outer layer (epidermis), we understand how important it is to bring more extensive care to this area of the skin. A cream brings added physical protection, which tends to be a good thing, but unfortunately, if it is too "waxy", the wax emulsion may cause clogging of the glands in the eye area. The eye area is abundant with sudoriparous merocrine glands, and the clogging of these can result in damages such as styes to the eye. A fatty oil would be preferable, but in turn would not bring proper physical protection to the area. It is therefore even more important not to put creams around the eye at night time, and put minimal amounts during the day. Use a small amount during the day, never at night. Using finger tip, gently dab a very small amount around under eye and outer under eye area. Avoid reaching the lash extremities and concentrate on the facial part of the eye lids. Organic Aloe Vera (Aloe bardadensis), Organic hydrolates: Cornflower (Centaurea cyanus), Rose (Rosa damascena), and Orange Blossom (Citrus aurantium amara), Shea Butter (Butyrospermum parkii), Organic Vegetal Oils: Rosehip seed (Rosa mosqueta), Evening Primrose (Oenothera biennis), Avocado (Persea gratissima), Jojoba (Simmondsia chinensis), Tamanu (Calophyllum inophyllum), Olive (Olea europaea), and Pomegranate (Punica granatum), Organic non-GMO Soy Lecithin, Soluble Collagen, Organic Plant Extracts: Eye Bright (Euphrasia off. ), Comfrey (Symphytum off. ), Elderberry (sambucus nigra), Gotu Kola (Centella asiatica), and Senna (Cassia angustifolia), Seaweed Extract (Laminaria digitata), Vegetal Glycerin, Sodium Hyaluronate, Vitamin E (d-α tocopherol), Blue Chamomile (Matricaria chamomila), and Sodium Benzoate.